Do you have teens who are reluctant to write? Do they think they don’t have anything worthwhile to say? Maybe they are intimidated by a blank sheet of paper? Or perhaps they see writing as just another assignment to complete. Don’t worry! 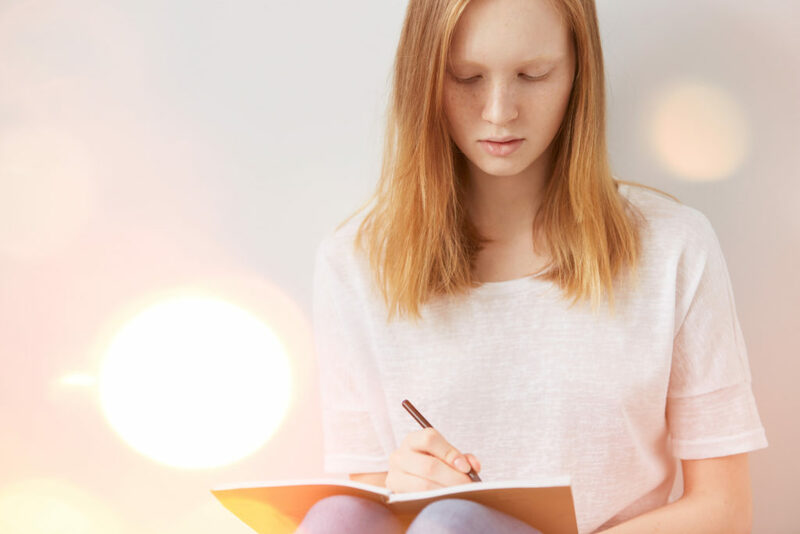 You can encourage your teens to write with these simple strategies. More than once I’ve found myself sitting in front of my laptop where that spinning “stuck” icon is in my brain, not the computer screen. (I have a Mac and call it the spinning beach ball of death 🤪) So I get why our teens struggle to write sometimes when we give them an assignment. At times the words just won’t come. It’s time to hit refresh for your teens minds with these simple strategies to encourage your teens to write. 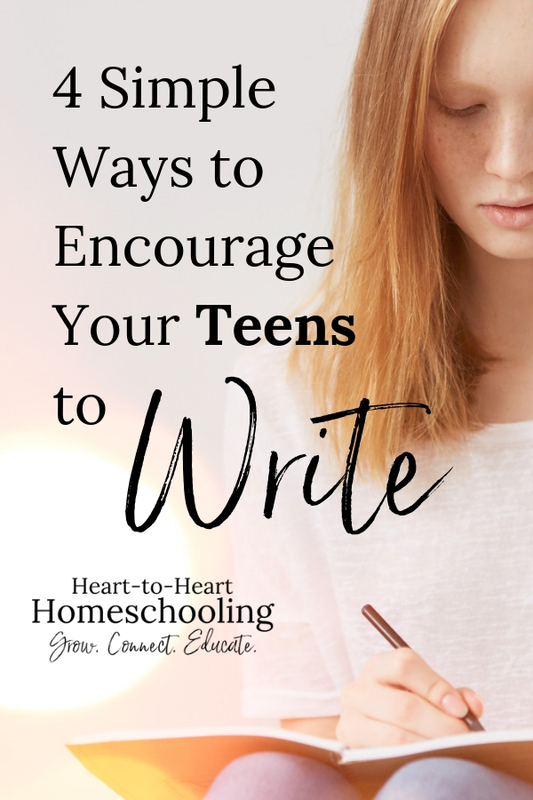 1.Encourage your teens to write by giving them time. Help your teens to choose the best. Teens need time. It isn’t uncommon to fill our schedules up to the point that having down-time is almost impossible. There are so many good things out there. But it isn’t worth it to do all the good things if our teens don’t have time to just be instead of do. So help them figure out what is the best and create a little margin in their days. Help your teens get control of technology in their lives. We find that technology means we are always doing something—checking social media, getting email, playing games. It’s amazing how addictive it can be. But if you want your kids to write, know they need time—time to think, time to read, time to explore. Boredom is actually something that benefits us and leads to creativity. Creativity means “the use of the imagination or original ideas, especially in the production of an artistic work.” Yes, writing is artistic work whether it is a research paper or a short story. Engaging writing comes from making connections, saying things in new ways, and expressing ideas so others understand. It involves insight, humor, and thinking outside-the-box. That sounds creative to me no matter what the format is. 2.Encourage your teens to write by setting up a good writing environment. Give your teens the knowledge they need. In order to write, teens have to have something to write about. Think of your teens’ minds as a bucket. If the bucket is empty, then they can’t get anything out of it. I know that seems obvious, but a thoughtful life produces thoughtful words. So make sure your teens have access to knowledge in a variety of forms—works of fiction and non-fiction, poetry and plays; news and documentaries and movies. Give your teens a comfortable place to write. Our environment does make a difference! Personally I love writing while sitting in a comfy chair, or even propped up in bed. But when I have more work related, technical writing, I’m more productive at a desk. Everyone is different, so encourage your teens to find what works for them. You can even go to a coffee shop together or the library and both get some work done. And having your space reasonably clean (not perfect!) and well organized can be really helpful for writers. Even the temperature of the room can make a difference. But the main point is, let them experiment knowing that it may be different according to the type of writing they are doing. Give your teens great writing tools. But obviously they don’t have to have their own (or even a compute for that matter)! 3. Encourage your teens to write through great conversations. One of the most beneficial things we as parents can do to help our teens develop any communication skill, is to practice the art of conversation. Of course the primary reason is simply to strength our family relationships. But by talking with our teens, we also help them to become better writers. Conversation involves more than simply talking to our teens. It involves talking with them. Good conversations happen when we are able to truly communicate. So listening is as important as talking, probably even more so. Discuss what they are learning about together. Ask questions that go beyond recalling facts. Help them to see the connection between ideas, concepts, and subjects. Talk about current events. Ask their opinion about the events in our world without criticizing. It’s fine if you bring up other points, but they need to know you are really listening and considering their ideas. Sometimes I’ll say something like, “OK, now I’m going to ‘play devil’s advocate’ here” so they know I’m not attacking their ideas—just helping them hone their arguments. Read aloud together even during the teen years and discuss the book. And if you teens balk at read alouds, you can still read some of the same books they do so you can talk about them together. Our family had some great conversations about The Hunger Games trilogy by Suzanne Collins. Writing is thinking, and because of that clear thinking leads us to write better. One way we clarify our thinking is to talk. To express ideas, opinions and have someone to dig deeper through questions. Conversation is a big part of the Brave Writer Lifestyle, as well as the next way you can encourage your teens to write: freewriting. 4. Encourage your teens to write by starting with freewriting. I first heard about freewriting while going through Julie’s Bogart’s, The Writer’s Jungle. The concept is simple, but effective. A timer, pen or pencil, and paper can unlock the words within your teen when done consistently. Your teens may not know it, but, yes they are writers. They have valuable things to say. Freewriting: The Key that Unlocks the Words will teach you how to do freewriting, step-by-step. If your teen is new to it, start with just 5 minutes. As they get more comfortable you can increase the time. We usually did it for 10 minutes, or maybe 15 if they wanted to continue. A question, quote, or fact from a subject they are studying. A photo. I love “Scary Place” from the Friday Freewrite section of the Brave Writer blog. And I’ve designed a free download of photographs to inspire freewrites you’ll find at the end of this post! Wordless picture books. Choose a page or let them look through the whole book and be inspired. Picture books. Read the story or be inspired by the illustrations. Picture books can be used in endless ways to prompt freewriting no matter what ages your children are. i find getting my teen to write means talking through his options. he likes research projects, he dislikes “write a story or express your opinions about this idea”. Research is totally where it is at for him. and I wonder if it’s worth fighting over….